After an efficient computer check- in, my Jet Blue non-stop flight to Grenada takes off from JFK without delay... and as always, the flight attendants greet me with a “happy to have you onboard” welcome and award winning service. 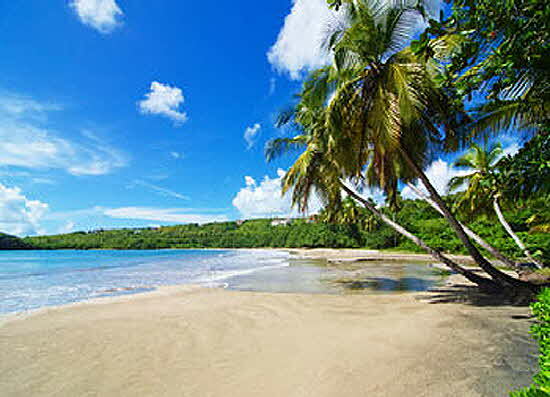 It is easy to fall in love with Grenada; it is an island where one feels special just being here. Smells of spices perfume the air; sounds of music penetrate the night. Grenada is pure soul; unique with its lush rain forests, cascading waterfalls, clear blue waters, white sandy beaches, fragrant nutmeg plantations, and luxury five star resorts... but what impresses me most is the island”s warm and welcoming people who love life, work hard to take care of their children, and are proud of their culture, food and music. “Music and Beyond”€�, a non profit, supports the development of local artists, inspiring them to create original music. With the launch of the first International Pure Grenada Music Festival€�, the island set sail on a unique and creative biodegradable future... using music, art and food as a platform to convey the message: “saving the planet is everyone’s responsibility, and by changing our habits, we can work together in an artistic way to achieve this goal”. One of the creative solutions to this issue is the recycling of waste paper and plastic into reusable art objects locals can use, and visitors can buy: such as turning glass bottles into red wine glasses and plastic bottles into whimsical chandeliers. The décor, designed and installed by visual artist Malaika Brooks-Smith-Lowe, and a team of local artists, interacted with space in innovative ways. Bamboo trees were hollowed and fitted with recycled materials and solar powered lights; large plastic bottles were turned into colorful octopus shaped chandeliers, and wooden shipping crates into comfortable love seats where one could sit and pedal to change the colors of lights. Malika tells me: “The Pure Grenada Music Festival entertains and educates in a purely aesthetic organic way, connecting the people of Grenada in a green project that uses culture to protect the island’s natural beauty and products”. The week long festival, held at a variety of venues (with Center Stage at Port Louis) got off to an emotional start by giving local talent an unprecedented once-in-a-lifetime opportunity to compete to play back-up for the stellar line-up of culturally diversified musicians, brought in from around the world, many Grammy nominees and winners such as: British Collective, Angelique Kidjo and Estelle. Throughout the day, and into the early morning hours, locals and visitors, young and old, swayed and gyrated to the pulsating beat of salsa, swing, reggae, jazz, hip hop and rock. It is common for a sunken ship wreck to serve as an artificial reef, but rarely strategically placed underwater art? After Hurricane Ivan ravaged the island’s ecosystem in 2004, British born artist Jason Taylor created an innovative underwater museum to bring the area’s fragile ecosystem back into balance. Life size sculptures, spread over an area of 800 square meters, depict Grenada’s culture and history. Created by a roster of talented artists, they attract a stunning array of marine life. Captain Howard takes me out to the reef on a Rigid Inflatable Pontoon boat. I don snorkel gear, jump into the water, and then follow our guide. I swim around the “Nutmeg Princess” (a tribute to the island’s spice industry), marvel at “Vicissitudes”, a circle of children holding hands that captures growing up through a lifetime of changes, and then linger in front of “The Lost Correspondent” (a relic in today’s society) which depicts a man working on a typewriter; his desk, covered in historical newspaper cuttings, documents Grenada’s involvement with Cuba. Swimming my way through this magical underwater kingdom, I am humbled by this amazing feat of artistry, social; consciousness and ecological planning. One of the rare acts of nature takes place at Levera Beach, on the Northern part of the island, from April through July when female Leatherback Turtles return to the beach where they were hatched to lay and bury their eggs. We drive for almost two hours to reach our destination, and then follow marine biologists down the dark deserted beach for about half a mile. A huge leatherback (I name Renada) has just .emerged from the sea, and has begun digging a deep hole. We watch in awe for more than an hour as she drops 120 eggs (the size of golf balls) into the hole. The scientists weigh, measure her, and place a tracking mechanism around one of her fins. Mesmerized, we watch her bury her eggs, using her back and then front flippers. When she is satisfied the eggs are safe, she rests for awhile, and then turns, slowly dragging herself back to the water. Sadly, I watch her disappear into the sea; knowing only one of her hatched eggs will survive. LaLuna Resort and Spa, a rare Nirvana, rises from the sea and a pristine white sand beach. It is a luxurious, yet unpretentious sanctuary for the senses, a fusion of Italian shabby chic and Balinese spirituality. Bernardo Bertucci, an Italian visionary, came to Grenada from a fashion background in New York. He scoured the coast in a boat; saw potential in a densely overgrown property, cut a path with a machete, and then spent 10 years overcoming a myriad of building challenges to prove his instincts, insights and creative DNA could turn his dream into the personal paradise he now shares with his wife Wendy, two daughters, a devoted staff and a maximum of 32 guests. Sixteen villas cling to the hillside; some tucked away in privacy, others with sweeping views of the sea; all painted faux shades of red, purple or blue. My room sits high on the hill; the Interior red stone walls match the outside of the building; .there’s a round soaking tub and a hand carved Bali Bed on a deck that is fragrant with flowering bougainvillea. A thatched roof pagoda covers LaLuna’s poolside Sunset Bar; Balinese oversized lounges and hand carved wooden figures pay homage to Indonesian Gods and Goddesses. Dwight, the bartender offers me a slice of margarita pizza; Chef Marco Sala sends out a warm octopus salad, a local dish made with beans to give it an Italian twist. It is succulent, tender and tasty. Dwight refills my glass with prosecco, sharing his dream of opening a bar in St David where he has a piece of land. Those fortunate enough to find their way to LaLuna have the added pleasure of meditation and yoga on the beach, and an authentic Balinese Spa. All the furniture, carved sculptures and amenities were personally selected by Bernardo and Wendy, and then shipped back to Grenada in huge containers. Balinese therapists are here on an exchange visa. Dewi, though small in stature, moves her powerful hands up and down my vertebrae, arms, and legs... stretching my limbs until they relax in submission. After my energizing massage, I retreat to the relaxation deck; I am brought a cup of ginger tea to sip. The trees sway in the gentle breeze; the sea awaits my stress-free body, and I honor her patience, swimming for hours. Bernardo recently completed, and is selling, five LaLuna Estate Villas, meticulously designed and furnished with top of the line Italian stone, white furniture and fixtures. Each 5 bedroom, 5 bath villa has a private swimming pool and wrap around terraces with sweeping views of the Grenadines. Ownership includes a 30 year yacht berth at the Port Louis Marina. He tells me: “LaLuna is my passion; the villas are my business”. Bernardo and Wendy Bertucci have carved a very personal paradise out of the love they share for each other and Grenada. My too brief stay took me on a unique organic nurturing journey that re-aligned my thoughts. As I am leaving Bernardo tells me: “you belong here”, and I thank destiny for leading me to LaLuna... a treasure beyond my expectations. Our last night on island, we are Sir Royston Hopkin’s guests at his superb Spice Island Beach Resort for a memorable dinner. Since my last visit, the dining room, lobby and spa were refurbished. We feast on a delicious rack of lamb and exceptional wines. Sir Royston, elegant as always in a custom made paisley shirt, is a personable gracious host. He has just returned from New York where he received the Six Star Diamond Award from the American Academy of Hospitality Sciences. The “pure essence” of Grenada has inspired me to reflect and act on the urgency and responsibility we all have to protect Mother Nature. Special thanks to Christine, Renee, the Grenada Tourist Board and Edwin Frank, our knowledgeable and reliable tour guide.